The Oakland-based eatery focuses on Russian food with a California twist. Ellen Doren and fellow chef Bulat Nasybulin. Professionally trained chef Ellen Doren noticed that, in the Bay Area, food trucks represent countries from all over the world — except for Russia, her home country. “The more trucks I saw, the more I saw that pretty much every single cuisine was represented — except for Russian,” Doren said. Doren is originally from Moscow, and her culinary resumé is impressive. According to her bio, she’s worked at upscale New York City restaurants including Gramercy Tavern and The River Cafe. She’s also worked as a personal chef; her clients have included several Warriors athletes. Kolobok’s menu focuses on blini, or Russian crepes. Blini are thicker and heavier than their French counterparts, thanks to the buttermilk used in the dough. For Doren, blini are full of nostalgia. “We grew up eating blini as a snack for after school as kids,” she said. According to Doren, they’re also a long-standing tradition in Russian culture. “Blini … have been made for centuries. They come from pagan culture, to celebrate solstice,” she said. They’re supposed to resemble the sun, with their round shape and golden color. Doren said the ingredients used in her blini are fairly true to what you’d find in Russia. The Bay Area crepe, for instance, contains kale, mushrooms, peppers, and red onions. “Kale is something that’s very Russian.” The crepe also contains avocado and chipotle sour cream for an added California twist. “Avocados are something that’s not Russian, but it’s something that we really love, and so do [other] people.” The St. Petersburg crepe features smoked salmon, green onions, capers, and sour cream. Along with several other savory crepes, there’s also a sweet crepe on the menu, filled with Nutella and bananas or strawberries and topped with whipped cream. The blini can even be made with gluten-free buckwheat flour. Aside from blini, the menu also features several regional specialties. Doren said the pelmeni — stuffed meat dumplings — originated in Siberia. The pelmeni are served with a cabbage-jalapeño slaw. Although jalapeño isn’t traditionally Russian, Doren said it serves as a locally available substitute for the spicy peppers you’d find in Russia. There’s also plov, a Southern Russian dish of spiced chicken and rice. As the weather cools down, Doren also plans to offer Georgian and Armenian stews. 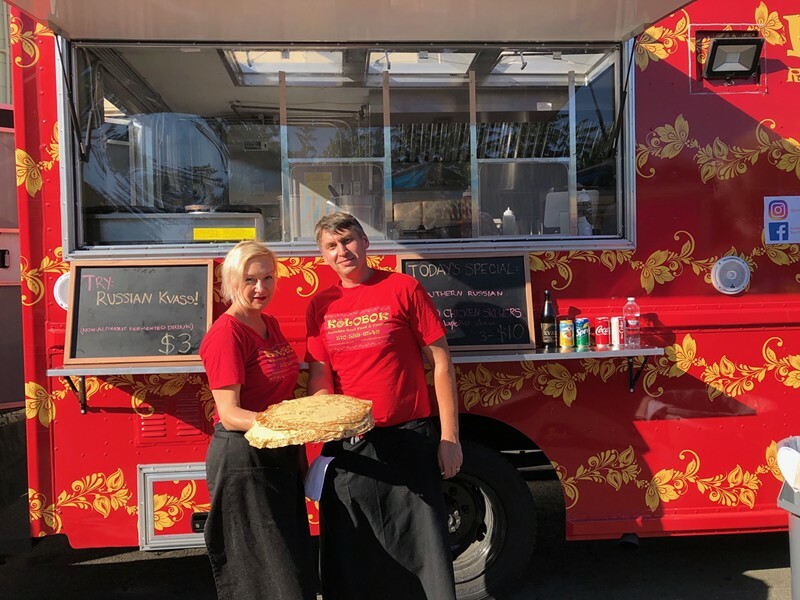 Kolobok’s newest venture is what Doren calls a “mini restaurant on wheels.” Along with the regular menu, customers can partake in a tasting menu and sit at the outdoor tables and chairs. The tasting menu starts with a Russian beet and potato salad called venegret, followed by a beet and cabbage borscht. There’ll be a rotating main course, and for dessert, there’s seven-layer honey vanilla cake. Doren said she’s surprised at the immediate positive reception Kolobok has received. Many of her customers have never tried Russian food before. “They’re very curious to try [it,]” she said. The truck also has a loyal following of Russian customers who text and call and drive long distances. Doren and Nasybulin put a lot of care into their food. “We pay attention to detail, and everything’s made to order,” she said. Kolobok is also meant to be fun. The truck is named after the Russian fairytale character Kolobok, a ball of dough who resembles the blini and pelmeni. According to Doren, Kolobok often goes on adventures and narrowly escapes being cooked, and he’s always happy. “He’s just a cheery little guy,” she said. Kolobok will be at Snow Park on Nov. 28, from 11 a.m.-2 p.m.; at San Lorenzo Street Eats on Nov. 29, from 5-9 p.m.; at the Oakland Museum on Nov. 30, from 5 p.m.-9 p.m.; and at Alameda South Shore Center on Dec. 1, from 11 a.m.-2 p.m. For more scheduled dates, follow Kolobok on Facebook or on Instagram @kolobokfood.